My sons, Evan and Brian, were lined up for an over-night fishing trip to Utah. We had not decided where in Utah, but the Red Creek trip on July 7th was not what I hoped it would be. And although Panguitch was great, it was too technical for a teaching trip for Evan. 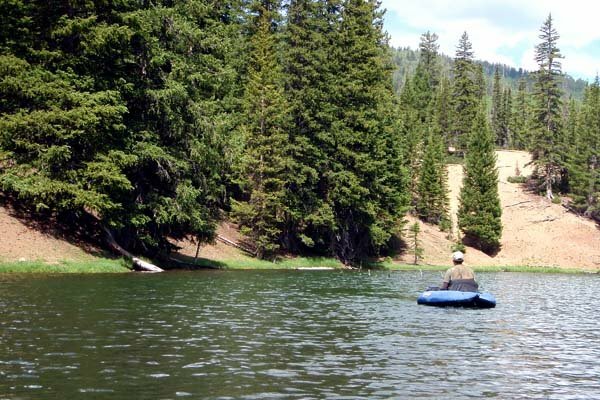 After giving it some thought I opted to take the boys, Brian and Evan, to Fish Lake National Forest just east of Beaver, Utah. 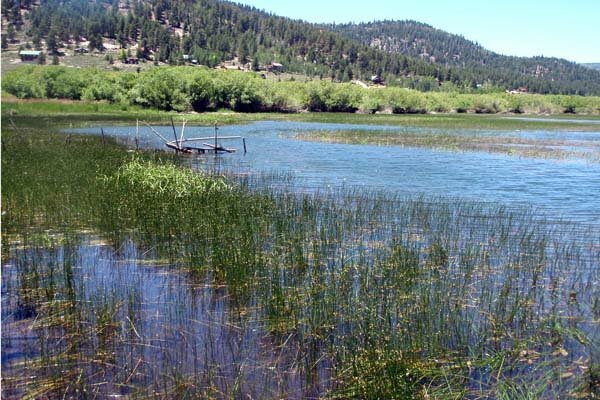 There are numerous lakes such that if one was slow there was another just up the road. And, being a farther drive from Las Vegas there should be less people. When I got home from work Friday afternoon I began the process of packing the truck for departure. Brian was at work and would not get home until after his weightlifting work out, or around 6:30 pm. That still left plenty of time to drive to Beaver and find lodging for the night and enable an early morning start up the mountain. But alas, Evan decided that he did not want to go on the trip. I mildly probed him to see if there was an uncertainty, fear, or other apprehension that could be dissipated or explained to his satisfaction. He simply decided that he just wanted to stay close to home. Although I was disappointed, I thought it presented an opportunity for Denise to have one-on-one time with Evan while I could do the same with Brian. On the drive that night Brian and I were quite chatty. I’m not sure how we got on the subject of my work years for the Nevada Test Site (NTS) contractors; I guess we were discussing college and work careers. I never really discussed much of those years with him, and he did not know much about the NTS. Through the three-hour drive I babbled on giving Brian a little history lesson that seemed to capture his interest. We decided that I needed to take him to visit the Atomic Testing Museum near UNLV’s campus. Saturday morning, after a hearty breakfast we gassed up the trout truck, inflated our tubes, and headed up Beaver Canyon with Anderson Reservoir as our destination. I first visited Anderson with my brother Neal in the late 1970s when I was just learning to fly fish, and again in August of 2004. 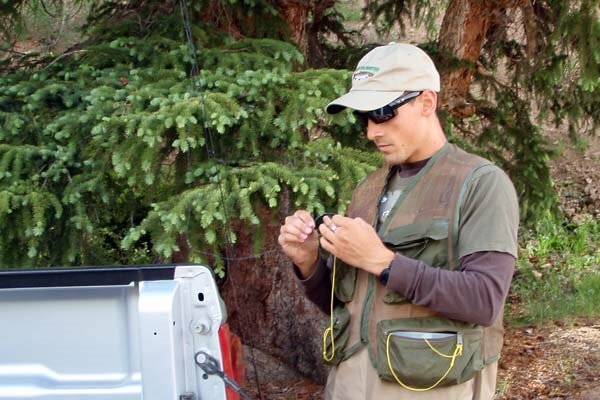 I had a blast in 2004, catching twenty trout in about four hours; one was about fifteen inches, so I was hoping Brian would have a great time catching lots of small mountain trout. 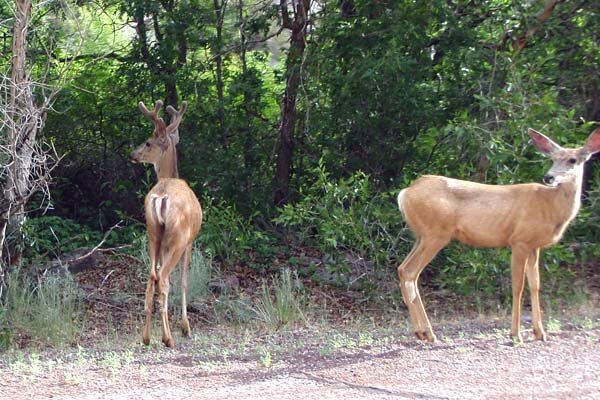 As an added bonus we saw four mule deer along the road as well as several marmots; wildlife always brings a smile on these outdoor adventures. 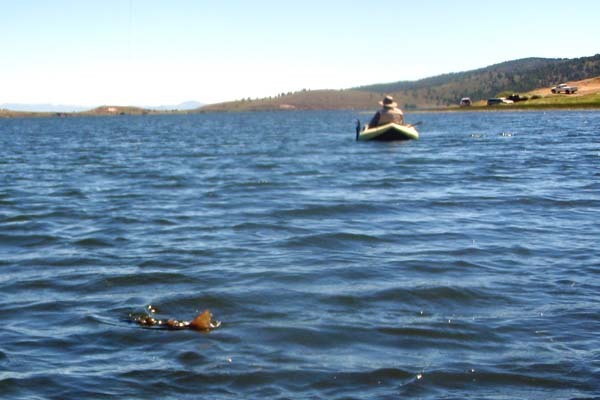 By the time we got to the reservoir there already were about seven to ten anglers fishing. 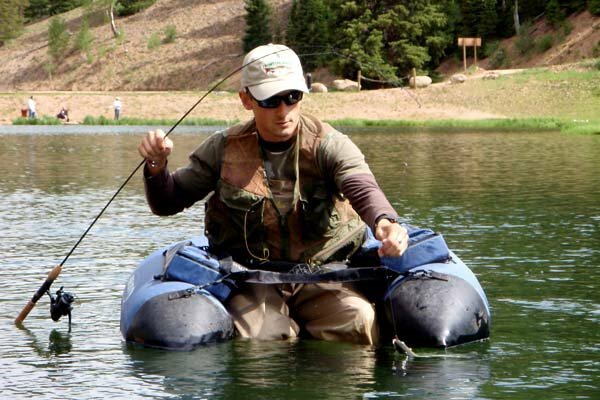 We were the first to launch float tubes, and I was quickly into several fish. Although Brian caught four, he was not satisfied with the experience. He saw me catch about fifteen or sixteen trout (I wasn’t counting, but it was a lot like August 2004), and he finally told me he wished he was fly fishing because it looked like it caught more fish (a little competitive streak, yes?). 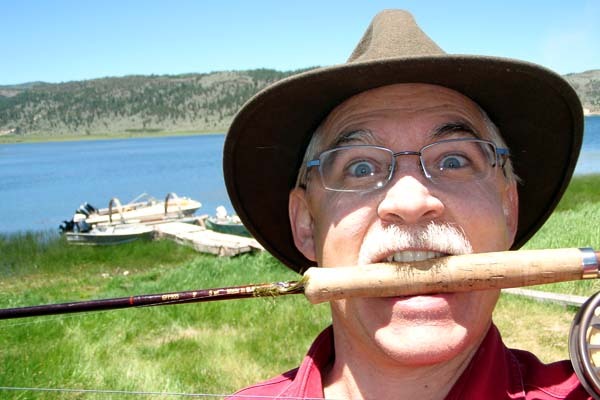 Sometimes it does, but fly fishing is not as simple to learn as a casting or spinning rod. It’s more like learning to throw a football; it takes a little practice before you can start to play the game. As I floated down to the inlet area I noticed there were lots of small but aggressive brookies feeding in the shallows, just like in 2004. 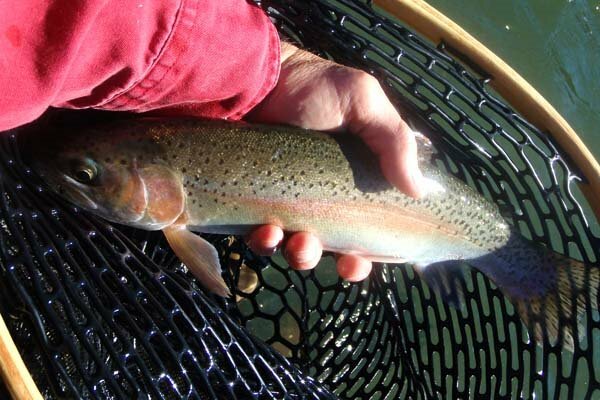 I was using my little six foot fly rod, and casting forty-five feet to these hungry trout brought strikes on almost every cast. I summoned Brian over, gave him a few fly-casting lessons and let him try for the brookies. 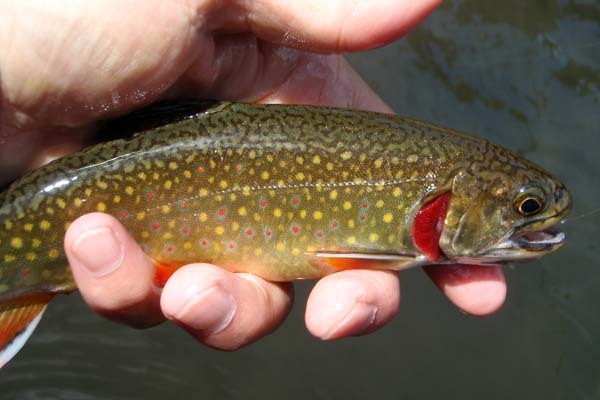 Upon retrieving a twenty-five foot cast on the fifth or sixth attempt he hooked and landed a little brook trout. I was very proud of him, and I promised to teach him more if he had the willingness to learn. Obviously, there will be more teaching trips to look forward to. It was about then when the thunder clouds rolled in, and at 9,500 feet in elevation we were all that much closer to lightening strikes. We decided to cut the trip short and head for the safety of the truck. Looking back, even though the trip was too long for a scant three or four hours of fishing, I surely enjoyed being with Brian and was awfully pleased we made the trip together. It's not always the quality of the time that matters in life, but the quantity. I often find myself challenged to share my resources and gifts with my family and others. James reminds us that hording our wealth is folly (James 5:3); too often we think of wealth only in terms of the physical or in relation to others who we think have more and we fail to see the great gifts of time and service the Lord has provided us and we horde them to our detriment. With that in mind the trip was a blessing all the way around. 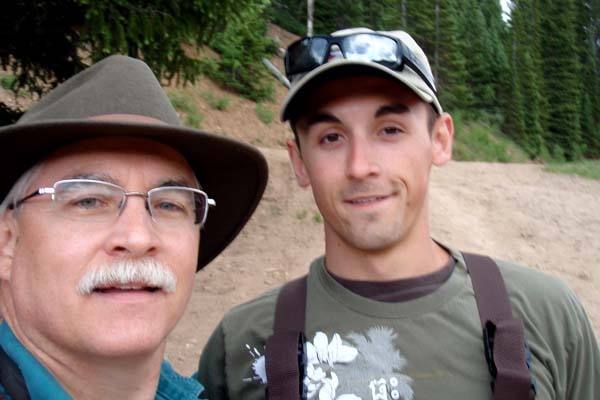 My son, Brian, and I had been discussing a short weekend fishing trip. The Vegas heat had arrived and I thought it was time to retreat into Utah’s high mountain country and escape the sweltering temperatures for a day or two. Besides, we had solicited my youngest son, Evan, to come with us. Since Evan had never fished before I had planned to spend the trip teaching him. Brian is working full time again this summer, and so we were plotting a weekend getaway for the 11th of July. Weekends often bring crowds to southern Utah, and I wanted Evan and Brian to feel comfortable and experience a fun and stimulating trip. When I was a youth I always jumped at the chance to go camping, fishing, or hunting with my brother Neal; to me those adventures were exciting to experience. And, the more isolated and alone we were the more adventuresome the trips seemed. 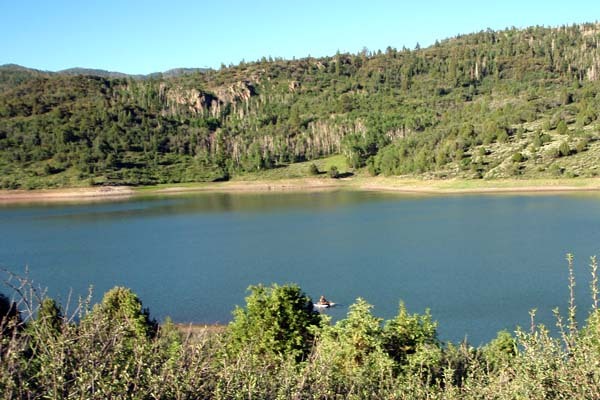 I had been considering Red Creek (or Paragonah) Reservoir for that weekend trip with the boys. It is a little more “out of the way” than the usual southern Utah lakes which might mean that the crowds would be less of an issue. 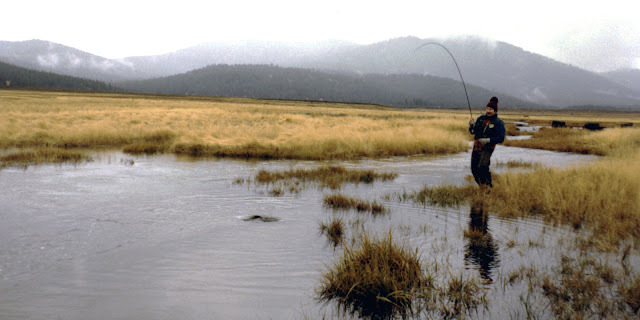 The problem was that I had never fished Red Creek and knew nothing other than what I had read in Utah fishing web sites. I decided to scope it out in advance, taking a day off work to test-fish the reservoir (at least that’s how I justified it). Red Creek was relatively easy to get to; a short dirt-road drive off of Interstate 15 at Paragonah. I put in near the Red Creek inlet and spent about 90 to 120 minutes fishing it from a float tube. 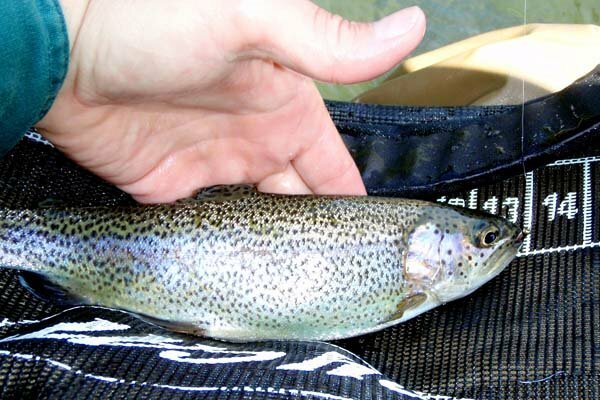 I caught just two trout: a nine-inch brookie and a fifteen-inch rainbow. 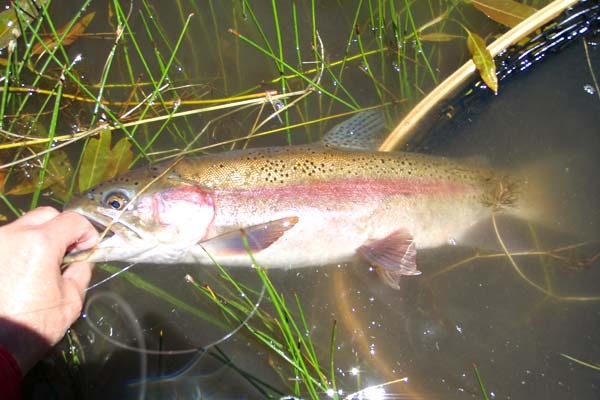 The rainbow was wild and pretty (they readily spawn up the tributary). But the action was very slow for my standards, so I knew it would be boring for Evan and Brian. I decided we would need to go somewhere else like Anderson Reservoir on Saturday. Not wanting to waste a perfectly good trip I decided to head to Panguitch Reservoir on my way home. 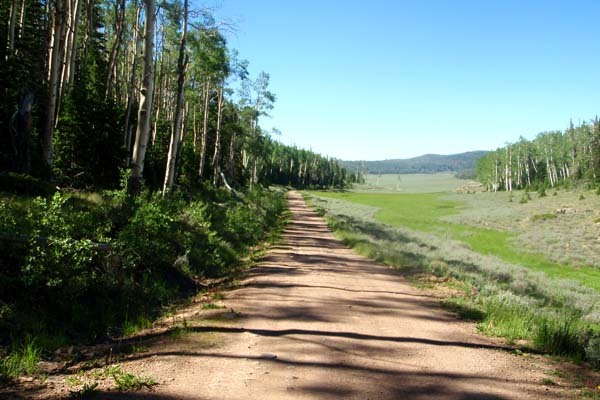 My DeLorme map showed a fifteen-mile dirt road traversing the nine-thousand foot mountain range separating the two reservoirs. Using MapQuest and Google Earth to verify the road’s existence, I pre-planned the circuitous route before departing Tuesday morning. Upon arriving at the north-eastern edge of Panguitch via the Horse Valley forest service road I noticed whitecaps on the water... not a good sign for a float tuber. 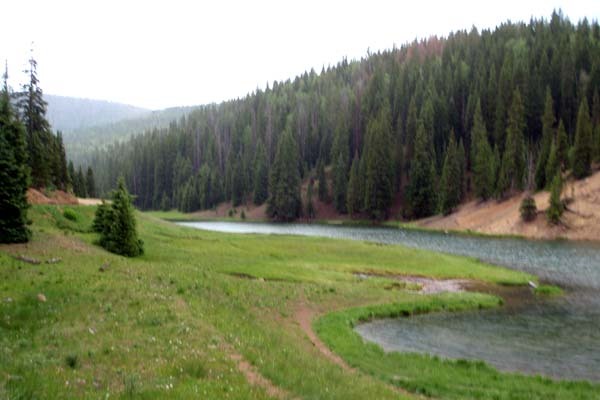 I circumnavigated to the southwest corner of the lake where Bunker Creek enters the reservoir. The water there was calmer (the westerly winds didn't seem to pick up as much strength until they reached farther out unto the large reservoir) and I quickly noted two other float-tubers on the water. Heck, if they could fight the breezing winds I figured I could, too. I quickly parked my trout truck on what was probably private property (it wasn’t posted that I noticed) and launched my tube. 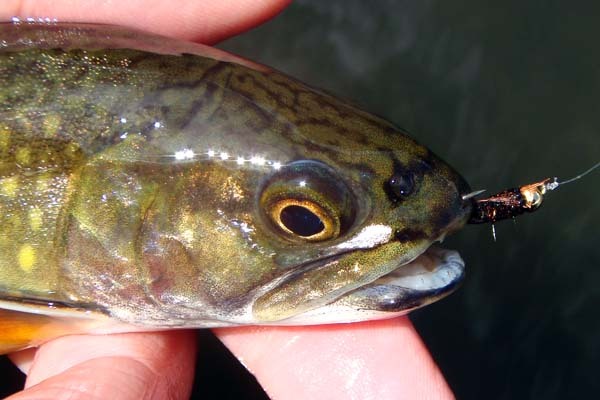 Panguitch has a “gap” limit: only trout smaller than fifteen inches or larger than twenty-two inches can be kept (all tiger trout - brown/brookie hybrids - must be released, too). 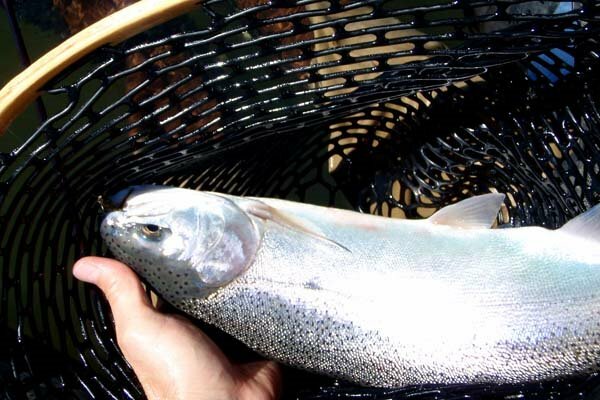 Forcing the release of trout fifteen to twenty-two inches is an indicator that sizable trout can be caught. Despite losing about six hooked trout I manage to land five beautiful fish. 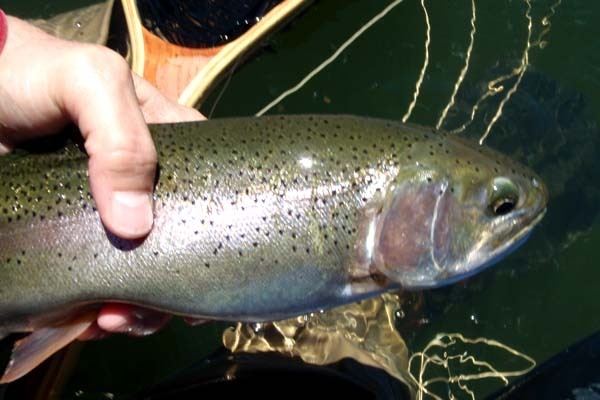 I landed one seventeen-inch cutthroat and four rainbows. The last rainbow was especially satisfying. As I was extricating myself from the water I couldn’t help but observe the channel coming right by the make-shift boat dock. It was close enough to the boat launching area that most would ignore it, and the bank-side willows to the south would prevent shore anglers from effectively reaching it. The angle of the sun to my position revealed a moving current that just begged to be explored. Having secured my float tube in the ankle deep shallows flooding the shore grasses I decided to cast a green wooly bugger up and across the current. My first cast was short of my target and so I tried again. As I retrieved I was rewarded with a hefty tug. To my surprise there was a twenty-inch male rainbow sporting a nicely defined kyped jaw who obviously owned that little stretch of current. Once again, I ended my day with the largest trout on my last and most satisfying cast. Fulfilled, and admittingly swelled with a little pride, I packed up and headed for home.